He used to be so anxious that he would barely leave the house – but now a York man with Down’s Syndrome has achieved the “impossible” by flying to a family reunion in Australia. Andrew Parker, 49, who lives in supported-living accommodation in Rawcliffe, has flown to Sydney to see his niece, Jacky, thanks to help from his dedicated support worker Audrey Lawrie. Audrey, who is currently studying for a diploma in health and social care at the University of York and works for the disability charity United Response, said Andrew’s confidence had soared since he moved into accommodation run by the charity 18 months ago. “Getting on board an aeroplane was not something that Andrew’s family thought possible, as he used to get anxious just travelling in cars or using lifts,” she said. “But with a reassuring support team with whom he has built up a trusting relationship, he eventually felt confident enough to undertake the long flight. “Andrew was naturally apprehensive when boarding, but once we were off he was fine. He was delighted when he saw his relatives all waiting for us at the airport. “The trip was amazing. Andrew had an apartment overlooking the Opera House and Harbour Bridge. “His sister, Sue, joined us a few days after we arrived, with her son, Stephen, and daughter Helen, so it was a real family reunion. 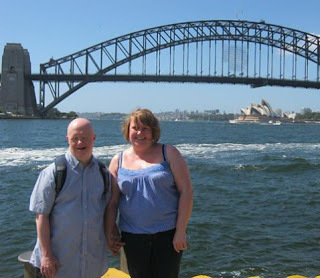 Andrew’s sister, Sue, said he had come so far since moving into supported living accommodation, where support workers made sure he got out and about and led a varied lifestyle. “Audrey in particular is great with Andrew. She’s very caring, knows his capabilities and doesn’t try to mother him,” she said.